Traverse City, the self-proclaimed “Cherry Capital of the World” is cherry sitting atop the state of Michigan. Situated in Michigan’s northern peninsula area this lake arcadia is the type of place that makes you say, ‘Ohhhh, this is the Pure Michigan town.” Traverse City is lake life America at its best and has shifted from a cherry farming town to one that is more geared toward boat life, vineyards, kite surfing, distilleries, and breweries. There is still cherry everything, everywhere. There are also these crazy beautiful old movie theatres as welcome byproduct of the Michael Moore fueled Traverse City Film Festival. Also, everybody is so nice because…Midwest. 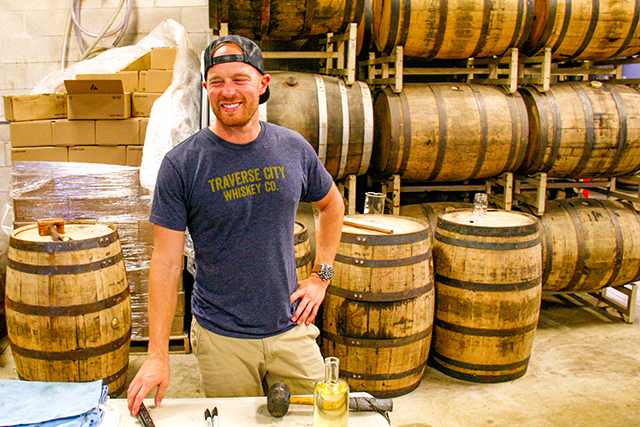 What better way to be welcomed to Traverse City than by the son of a cherry farmer, Chris Fredrickson and his partner Moti Goldring who are the founders of Traverse City Whiskey Co. These gentlemen showed me their town and so Thirsty is able to give you the best 24 hours in Traverse City you can get. To begin, start of with a robust tasting of the top bottles in the Traverse City Whiskey Line at the company’s tasting house. See the full line up in the image. If you feel like you are drinking early, don’t. 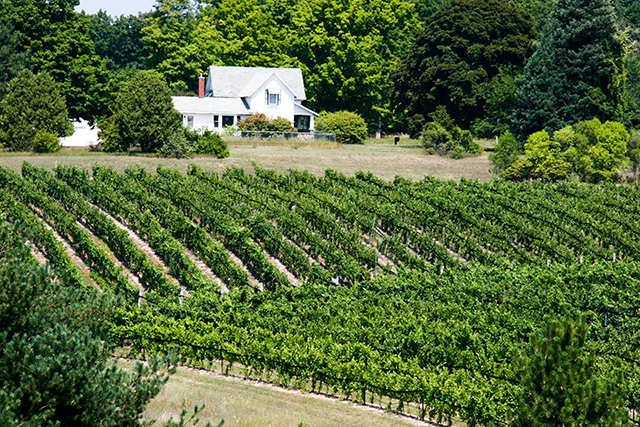 There are bike tours that through the Traverse City which stop for tastings early in the day. They come thirsty and aren’t just drinking water. After an aggressive morning, grab some food, and maybe a couple more drinks at The Apache Trout Grill. 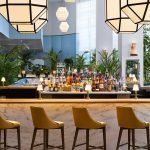 This eatery is situated directly at the feet of Lake Michigan and provides the perfect place to sip a seasonal cocktail from what will assuredly be a menu sourced of locally sourced spirits. There, of course, will likely be a cherry cocktail in the mix along with beer from a local Traverse City brewery. One of the more notable breweries in Traverse City is the Monkey Fist Brewing Co. This is because the beer is good, but also because they have a red umbrella spewn beer garden area in front of their building right in the heart of town. The brewery is attached to the State Street Market, which is like a hipster mall of tourists containing; beer, food, and shopping. After lunch, hit the water on a boat. It’s on ship or a Lake Michigan beach where you will find the real gems of lake life in Traverse City. There are numerous beach’s sprinkled along secluded islands and the shoreline of the Northern Peninsula. Bonfire party’s crop up on local whims and these are going to be the best party’s. A top spot to anchor your boat offshore is around one of the alcoves of Power Island. This island is a national park right in the heart of the lake. You can safely anchor your boat here and watch the sunset while taking a dip in the emerald and indigo fresh lake water. Once the sun has set the best place in Traverse City to start out your night is Little Fleet. This is an outdoor 3-sided food hall given its structure and functionality by literally a little fleet of food trucks. There are 7-8 trucks to satiate any kind of hunger offering everything from tacos to BBQ. 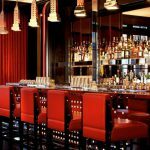 On the 4th side of the square you will find a fixed bar with hand-crafted cocktails and rotating bottles of small batch spirits. Cocktails like the Hibiscus Rujero Singani cocktail (Singani is like a Bolivian Pisco) which graced the spring menu are examples of how wide-ranging some of the offerings go. 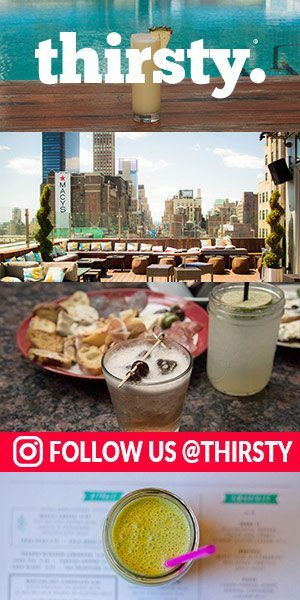 It really depends on what kind of night you’re in the mood for in Traverse City, the city has a vast range of options for a place that has the feel of a quaint lake town. Nolan’swould be your prototypcal cigar bar, and Taprootis a cider centric bar with a rustic feel. If you are looking to get rowdy though head to Kilkenny’s, a subterranean Irish pub with a dance floor. Here you will find bachelorette party’s being hunted by bachelors and fading inhibitions. 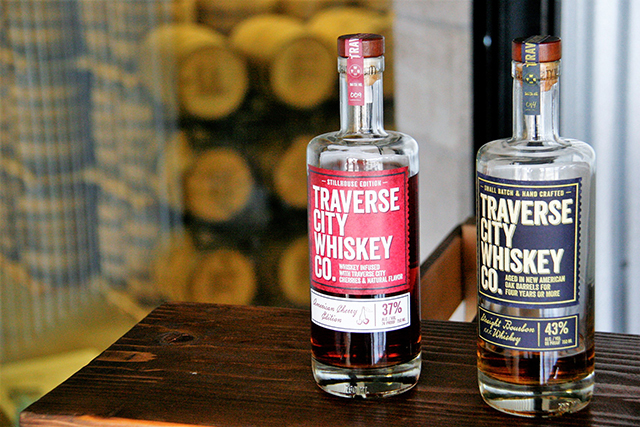 If you need some social lubricant, order up shots of the Traverse City Whiskey Co American Cherry Edition Whiskey. This slightly below 80 proof spirit is made using locally sourced cherry’s. While this spirit goes down smooth and you can taste the fruit, it’s not sweet, and you won’t forget your drinking whiskey…or maybe you will. The late night place in Traverse City is a bar called “U and I” that reminds you that you are undeniably in the Midwest with things on the eclectic menu like fried cauliflower in this classic American bar. 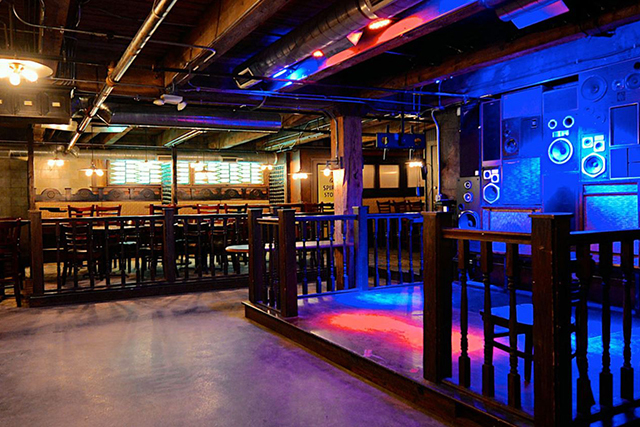 Just get a lager or local Michigan beer at this venue. If made it through a night in Traverse City, hitting even some of these locations, you are going to need some of the hair of the dog to help you get through the following day. Head to Towne Plaza, and get a seat outside in the heart of the village. 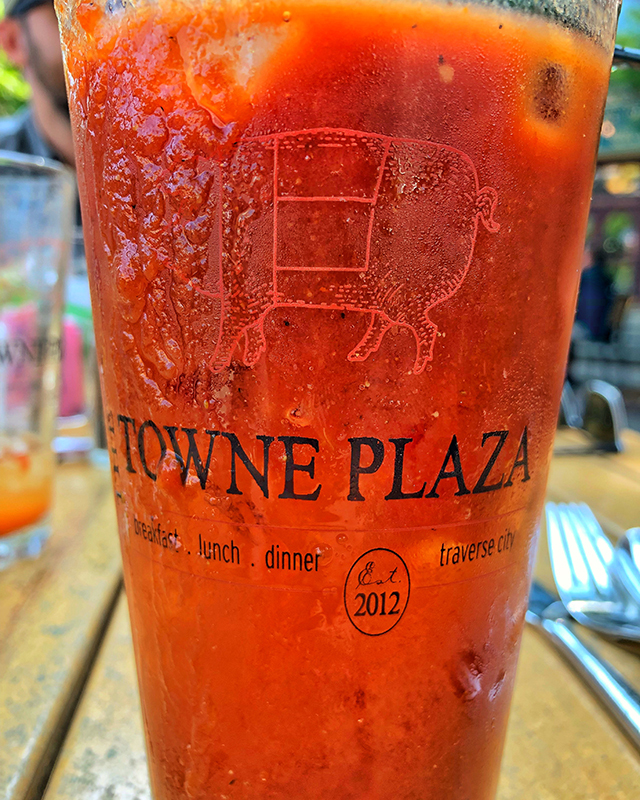 They have a deft cocktail menu, but go for the thick and hearty Chipotle Bloody Mary. Just for good measure to truly cap off the trip you should drive the big ten minutes up to one of the vineyards which surround this lake paradise. Brengman Brothers is situated atop a picturesque hill and while they have wine go for the housemade Amaro to settle your stomach after brunch while you enjoy the views from the patio. Traverse City is one of America’s great lake towns with a feel all it’s own due to diversity and a reinvigorated sense of industry rooted in food and drink. One last pro tip: most of the good bars will have a house soaked bar cherry from the local farms and these sweet morsels are worth getting at more than one of the places you may venture. Everything is always just that much better with a cherry on top.